COLUMBIA, S.C. – Newly minted officers from the S.C. Department of Natural Resources (DNR) graduated on April 19 from the South Carolina Criminal Justice Academy for its Basic Law Enforcement class. The 14 new officers for the past several weeks have undergone intense training, covering such topics as criminal domestic violence, gangs, and firearm safety, ethics in corrections, searches, security inspections, and interpersonal communication. In addition to Director Taylor delivering the key note speech, he also recognized one of his own. M. Chase Stewart of Woodruff was awarded the J.P. Strom Award as well as the Clifford A. Moyer Marksmanship Award. The J.P. Strom Award is given to the student with the highest cumulative point total for all written test given during the twelve week training. This award is named after the long-time Chief of S.L.E.D (South Carolina Law Enforcement Division). Also graduating were the following: Lukas Allen, Daniel Alspach, Marion Baker, Alex Branham, Jonathan Burnett, Shannon Depiesse, Preston Garner, Patrick Nettles, Daniel Newell, Lewis Norris, Rodney Paulk, John Piersol, Kevin Ryan, Gilmore Stevens and Chase Stewart. Immediately following the basic training course, the officer attends an eight week training course specific to the DNR Law Enforcement Officer. The DNR Law Enforcement Officer represents the S.C. Department of Natural Resources to the public. The major responsibility of the officer is the enforcement of hunting, fishing, and boating laws. There are many tasks which are performed in meeting this goal of law enforcement including prosecution of court cases, public education, search and rescue operations, and investigation of complaints and accidents. There are also routine tasks which are important to the job such as record keeping, form completion, and vehicle and equipment maintenance. 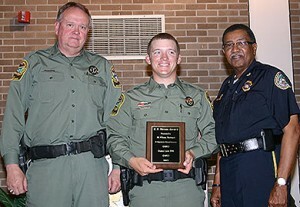 More about DNR Law Enforcement at http://www.dnr.sc.gov/law.html.